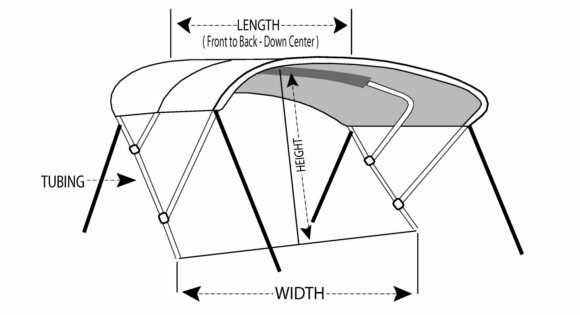 Choose your Bimini Width 47"-53" 54"-60" 61"-66" 67"-72" 73"-78" 79"-84" 85"-90" 91"-96"
Measure the distance between the mounting points on each side of the boat. Select appropriate range to include your width. To Find Mounting Points - Select a point on each side of the boat that will be the middle of the bimini based on the desired length. 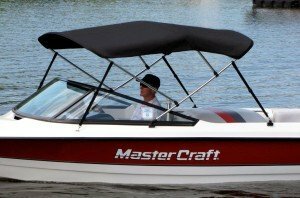 The amount of shade coverage you want from your bimini - generally from in front of the captain's chair to behind the middle seats. The height of the bimini is the height from the mounting points to the underside of the top. To determine the standing height, measure from the floor of your boat to the mounting points on the side of the boat, then add this measurement to the quoted height of the bimini. Bimini tops are available in different sizes and lengths. 3 and 4 bow tops come with free storage boots. All Biminis include the necessary hardware, hold down straps, frame, and canvas. Westland Biminis allow you to enjoy your day on the water by protecting you from harmful UV rays and light rain showers. Made from durable fabrics such as Sharkskin and Sunbrella®, these Biminis offer shade from the sun along with water repellency. It's impossible to truly enjoy your time spent on the water when you are constantly having to shade your eyes from the sun. Solve this problem and improve the appearance of your boat with a new Bimini top made by Westland Industries.